Notes: Poorly sign-posted and in a remote area you are advised to use the Sat Nav. There is a small layby in the vicinity of the footpath to the castle. The stone foundations of a castle built by the Welsh Princes including the visible D shaped towers that characterised such fortifications. The castle is situated in stunning scenery which makes the trip worth it alone! Castle is managed by CADW. 1. Aside from Castell-y-Bere, Llywelyn ap Iorwerth (the Great) is credited with founding Dolwyddelan Castle, Degannwy and Dolbadarn Castles. He may also have built Castell Carndochan and Castell Cwm Prysor. 2. Following the second War of Welsh Independence the English strategy of control consisted of either building garrison fortresses (examples are Harlech, Rhuddlan and Beaumaris) or repairing Welsh castles (for example Criccieth) for the same purpose. Whilst Castell-y-Bere was occupied for the 1283-94 period it was abandoned thereafter; the key difference from the other outposts being the inability to resupply by sea – Edward’s cost effective way of sustaining the conquest of Wales. Although only having an operational life span of a little over 70 years, Castell-y-Bere saw action during the second War of Welsh Independence. Built by the Llywelyn the Great it was seized by the English in 1283, attacked by the Welsh in 1294 and then abandoned. Castell-y-Bere was built by Llywelyn ap Iorwerth (the Great) in 1221 on lands seized from his illegitimate son, Gruffudd ap Llywelyn, in order to assert his supremacy in Meirionnydd and to dominate a major trading route through the mountains. Like other castles built by the Welsh Princes its layout followed the form of the rocky outcrop on which it was built with the defences consisting of a small curtain wall augmented by large D shaped towers. Situated on the west coast of Wales, Castell-y-Bere played no part in the first War of Welsh Independence which ended in 1277 with the defeat of the Prince of Wales, Llywelyn ap Gruffudd, and the loss of much of Eastern Wales to Norman control. In 1282 the second war began; initiated by Dafydd ap Gruffudd, brother to the Prince, Llywelyn had little choice but to participate. It turned into a disaster when he was killed in 1282 with Dafydd assuming the title Prince of Wales. 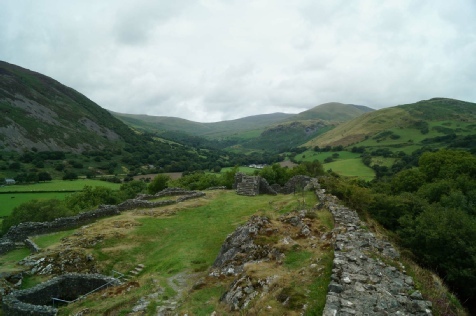 Peace overtures failed and the English forces pursued Dafydd who fled first to Dolwyddelan Castle, then to Castell-y-Bere and finally to Dolbadarn Castle. One by one the English took these strongholds and in April 1283 Castell-y-Bere was attacked by a force from Montgomery led by Robert l'Estrange and William de Valence. The castle was surrendered, rebuilt by the invaders and used to support an English garrison. In 1294 the Welsh rebelled under the command of Madog ap Llywelyn who attempted to capture Castell-y-Bere. The historical record is unclear whether the attempt was successful or not – certainly the associated settlement was burnt but it is not known whether the castle fell to the rebels. Either way the castle was abandoned and made indefensible after the rebellion probably due to the inability to easily resupply such a remote location.